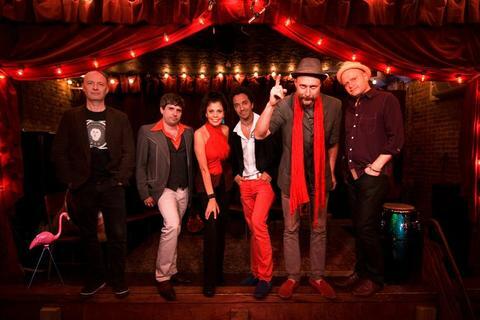 Chicha LIbre is a Brooklyn collective made up of French, American, Venezuelan and Mexican musicians who play a mixture of Latin rhythms, surf and psychedelia. Chicha is originally the name of a corn-based liquor favored by the Incas in pre-colombian days. Chicha is also the name of Peruʼs particular brand of electric cumbia first made popular in the late 60ʼs in Lima and the Amazaon. While loosely inspired by Colombian cumbia, chicha incorporated Peruvian melodies, some Cuban son, and the sounds of surf guitars, farfisa organs and moog synthesizers; an oddly post-modern combination which was close in spirit to the Congolese rumba of Franco or the pop syncretism of Os Mutantes. While Chicha Libreʼs repertoire has evolved from the Peruvian canon, their sound and approach are still indebted to the Peruvian bands it originally emulated. Their new album, Canibalismo (out May of 2012 on Crammed Disc/Barbès) is inspired by the Cultural Cannibalism dear to the Brazilian tropicalists and the production values of late 1960ʼs rock bands. The group still pays homage to the likes of Ranil and Los Mirlos, but mixes it up even more by combining mellotron and other vintage synths with African guitars, treated percussion, fuzztone and some R.D Burmans inspired arrangements. Chicha Libre has performed around the world, including Turkey, The UK, Germany, Portugal, Belgium, Denmark, Colombia, Argentina, Brazil, Spain, the US, Canada and, of course, Peru. They have showcased at WOMEX, in Copenhagen, and Globalfest, in NYC. They have played in Los Angeles with guitarist Jose Carballo, of Chacalon y la Nueva Crema fame, in Lima with Los Shapis and in Berlin with Ranil, the legendary cumbiero from Iquitos. They have toured with cambodian psych-band Dengue Fever and shared the stage with bands as varied as Brazilian Girls, The Skatalites, Frente Cumbiero and the Orchestre Poly-rythmo de Cotonou. Chicha Libreʼs music has been featured in the TV show Weeds and a Simpsons 20th anniversary special in which they were asked to play the Simpsons theme “chicha” style alongside the likes of Red Hot Chili Pepper and ZZ Top. They have also scored a Vaclav Havel play which was performed at Colombiaʼs Miller theater in the authorʼs presence and two Charlie Chaplin films which they performed at NYʼs prestigious Merkin Hall. Their first CD, Sonido Amazonico, is available from Barbès Records in North America, Crammed Disc in Europe and Random Records in South America.